With many North American crops in trouble due to severe drought conditions, analysts will be looking at Asia for signs of food inflation. Food inflation may prevent Asian countries from lowering rates, potentially creating growth problems not just for Asia, but globally. Right now the focus has shifted to India and the rising risks of a poor monsoon season. The Hindu Business Line: - Weak monsoon poses a challenge in maintaining the high food production, the Agriculture Minister, Mr Sharad Pawar, said here on Monday. The monsoon deficit continues to be at 23 per cent till date, but there is no drought-like situation, yet, he said. Rueing that India’s agricultural growth is still influenced by monsoon and vagaries of nature, Mr Pawar said meeting the 4 per cent growth was a challenge this year. He said kharif sowing [planting for the autumn harvest] will go on till the first week of August even as farmers anxiously wait for rains. This is a dangerous development when combined with the US drought. Food accounts for almost a third of the CPI measure in a number of Asian countries. Even prior to the increased upside risks to food prices, Asian nations had little room to lower rates in response to the global slowdown. 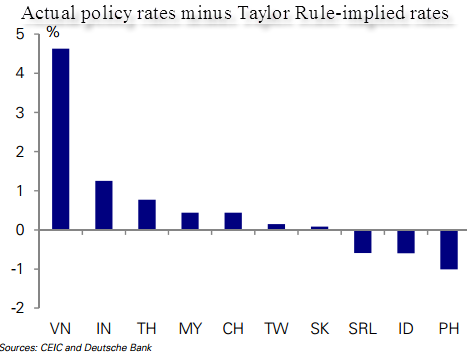 In spite of significant rate hikes since the lows of 2009 (chart above), rates for most Asian countries are roughly where they should be (except for Vietnam) based on the Taylor Rule (chart below). 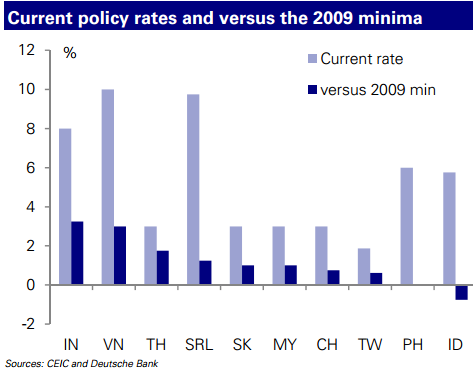 India and Thailand could lower rates another 100bp, but that's about it. In Sri Lanka, Indonesia and the Philippines the rates may already be too low. As poor harvests propagate through the system and food inflation risks kick in, lowering rates further to stimulate Asian economies could become problematic. In fact these developments could spell stagflation for a number of nations in Asia - an extremely difficult situation for central banks to address. DB: - Recent increases in wholesale and futures prices for corn and soybeans do not yet constitute enough of a potential threat to price stability to imply a need for rate hikes. But drought in the Western Hemisphere and a so-far disappointing monsoon in India do suggest that the risk of “stagflation” in Asia may be rising.